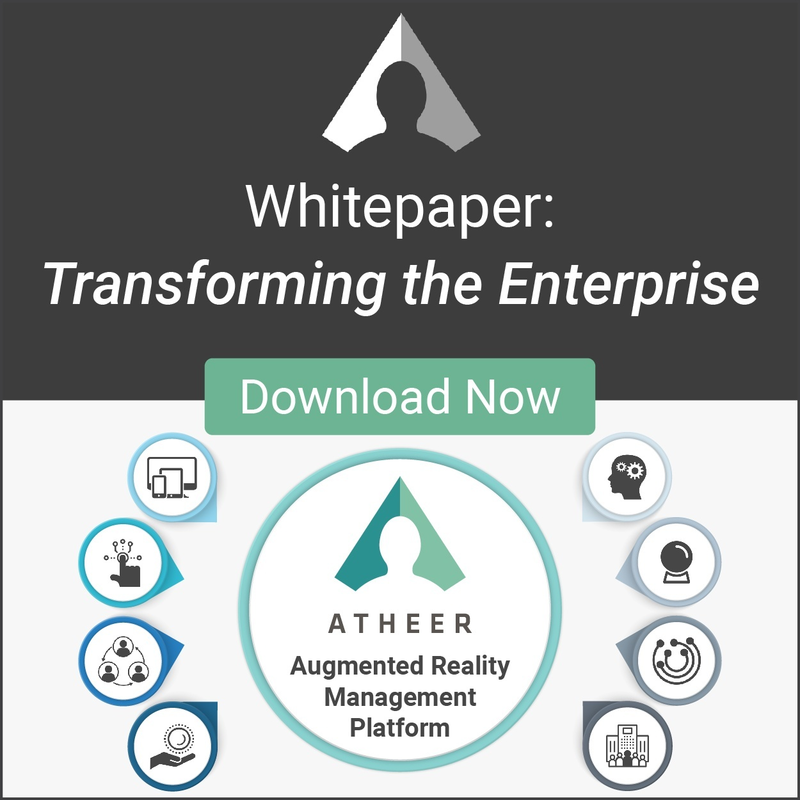 MOUNTAIN VIEW, CA, OCTOBER 9, 2018 – Atheer Inc., a leader in enterprise augmented reality (AR) solutions, today announced the introduction of the world’s first Augmented Reality Management Platform for industrial enterprises. The AR Management Platform is a new category of enterprise software aimed at meeting the biggest challenges facing business today, with the goal of empowering the 2.7 billion deskless workers that have been traditionally underserved by technology solutions. It is aimed squarely at helping enterprises tackle the velocity of business, product and technology change, the opportunities and challenges of advances in connectivity, the scarcity of resources and talent they face as well as the massive complexity of running large, at-scale operations. Atheer says the key to meeting all of these challenges lies in technologies that empower frontline industrial workers with appropriate digital solutions. According to a recent study by Emergence Capital, the majority of the world’s workforce (in industries such as construction, manufacturing and agriculture) are the 2.7 billion “deskless” workers who have been “forgotten and overlooked by technology providers”. In a new White Paper accompanying today’s announcement, Atheer underscores the vital role that an AR Management Platform can play in meeting the needs of these forgotten workers and how meeting their needs will provide the opportunity for a fundamental shift in the way industry works. The AR Management Platform is also welcomed by industry analyst firm Aragon Research. "The Augmented Reality Management Platform, as pioneered by Atheer, marks an important milestone for Augmented Reality in the enterprise, said Jim Lundy, Founder and CEO at Aragon Research. "Aragon believes that the advent of the Augmented Reality Management Platform (ARMP) will truly transform how enterprises – and the supply chains that work with them – run their business and support their workforces. There are eight pillars to an AR Management Platform. It is device-agnostic, supports natural interactions, offers real-time ‘see what I see’ video, audio and text-based collaboration, digital asset management, offers contextual awareness, a predictive experience, performance analytics and is enterprise-ready. Device-agnostic – Enterprises need to be able to use an AR Management Platform on the operating systems (including iOS, Android and Windows 10) and devices (including smart glasses, tablets, smartphones, wearables and laptops) that make sense for their business and their use case. They need to be able to leverage existing investments in hardware, connectivity, device management and security – all with the knowledge that the value of their cloud-based AR Management Platform will continue to grow and evolve as they take advantage of new AR hardware and operating system enhancements. Supports Natural Interactions – Workers need to be able to use an AR Management Platform regardless of their use case, so it needs to support the broadest possible set of interaction modes. In many industrial settings, workers need the ability to work with AR devices (such as smart glasses) that offer hands-free operation (as they are using tools with their hands, wearing safety gloves or working in messy environments). In such cases, they may want to use voice control, hand gestures or gaze to control their AR devices. There will also still be many situations where traditional touch controls (as provided on typical smartphones or tablets) offer the easiest and best interaction mode for that task. Real-time Collaboration – From training to troubleshooting, being able to collaborate in real-time using “see-what-I-see” functionality, group calling and shared content can dramatically cut down the time required to meet a given business challenge. Being able to instantly share and discuss an issue with a remote expert (or multiple remote experts from across the supply chain) provides huge and immediate value to enterprises. Digital Asset Management – An AR Management Platform needs to be able to access and deliver all of an enterprise’s key digital assets, including video, images, audio content, PDF documents, step-by-step work instructions, dynamic warehouse pick lists, checklists, linked workflows, and surveys. Contextual Awareness – An AR Management Platform must be context-aware. This awareness goes beyond the most simplistic information about time, location and user identity that most mobile applications provide today. The platform needs to provide context in a deep and sophisticated way by making using of key data points to inform the experience and content offered to the worker. That data could include background on the skills and expertise of the worker performing the task, data about the equipment being worked on, information about the last time a given piece of equipment was serviced, as well as IoT data from sensors. The sensor data could provide even further insights, such as the temperature of the device or the room it sits in, the air quality of the environment or live “machine state” information. Contextual awareness drives an experience that truly augments the experience of a worker accomplishing a set of tasks. Predictive Experience – All of the data about context, when combined with machine learning and artificial intelligence, can yield profound predictive experiences for users of an AR Management Platform. Those experiences may be as simple as an assistance prompt for a user whose history shows they are continuously having problems with a particular section of a complex series of work instructions. By proactively offering that particular user the contextual guidance it is clear that they need – or a video call with a relevant expert – you can help that user be more productive. Performance Analytics – There are many circumstances under which users of an AR Management Platform will be able to gain vital business intelligence from the performance analytics data it provides, at every level of granularity. At the individual user level, it is possible to see how well a given set of work instructions is helping that user – and where the work instructions might need tweaking to be more effective. That same analysis could be carried out for a team, a department – or even the whole enterprise. Enterprise Ready – To be effective, an AR Management Platform needs to offer the reliability, availability and security expected by enterprises, along with necessary integration capabilities (with ERP systems, service clouds, WMS systems, PLM systems, content management systems, data repositories, active directories), as well as scalability and extensibility. To see Atheer in action and get a demonstration of the AR Management Platform, visit the Atheer booth at the Enterprise Wearable Technology Summit (EWTS) in Austin, Texas from October 9th-11th, 2018.